With headline-grabbing events in Istanbul, London and Jakarta under their belt, Modest Fashion Week’s second Dubai showcase saw the region’s finest fashion talents unite for a weekend of true design diversity. 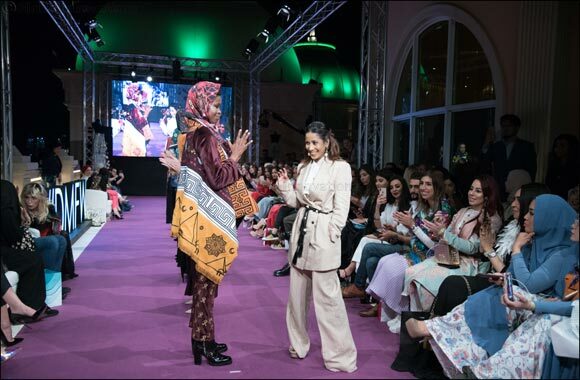 Dubai, UAE, March 13, 2019: Returning to Dubai for the second time, Modest Fashion Week 2019 brought an array of modest fashion designers, industry experts, fashion buyers, media, VIPs and influencers to the city for a spectacular three-day style showcase. With Dubai’s magnificent skyline making the most breathtaking of backdrops, over 40 designers from more than 26 countries took to the catwalk for the second edition of Dubai Modest Fashion Week, held on the stunning rooftop of miX BY Alain Ducasse at Emerald Palace Kempinski, Palm Jumeirah. Spanning three days over International Women’s Day Weekend, DMFW 2019 launched on Thursday, March 7, with a welcome by Modest Fashion Week founders Ozlem Sahin and Franka Soeria. Inviting guests to engage in something unique during their time at the event, which focused upon the inclusivity of fashion and the support of worthy global causes, DMFW 2019 kicked off with a fascinating talk by the Council of Modest Fashion, followed by the first runway show of the weekend. Leading with designs by the UAE’s Sheikha Hend Faisal Al Qassemi, followed by collections from Niswa Fashion (USA), Imen Bousnina (Austria), Adrianna Yariqa x Gret By Ortenhill (Singapore), CR by Tika Ramlan (Indonesia), College of Fashion Design Dubai (UAE) and Sweet Dulce (Iran), Abu Dhabi-based designer Asiya Rafiq’s Dream & Design for Disabilities showing was the perfect pre-cursor to the humanitarian-focused Talk Show that followed the weekend’s first impressive catwalk show. Moderated by Sabrina Salhi, with speakers including DMFW founders Franka Soeria and Ozlem Sahin, designer Asiya Rafiq, influencer Dr. Passant Saleh and Grace El Mahmoud from Shea Global, second Talkshow “Fashion for Good” covered a variety of topics including female body image and the work of Grace El Mahmoud with the under-privileged women in Kenya to highlight this year’s International Women’s Day. The second catwalk show featured collections by designers from Azerbaijan and Russia, including exquisite designs from Ahada, Zahra World (Russia), Anara Zakirli (Azerbaijan), Lyaman Hajiyeva (Azerbaijan), Hijab Queen and Nargiz Shakhbazi (Azerbaijan), topped off with an exclusive show from acclaimed Kuwait-based label, Anotah. Thursday’s third Talkshow brought influencers Nia Amroun, Asma Lootah, Yassmin Jay, Ifrah, Alia Awwe together with moderator Ines Sebiane to share style tips before the final show of the night: a vibrant showcase of designs from Raidha’s Maldives (Maldives), Kazeca Studio (Australia), Jawhara Syari (Indonesia), Lebasi (USA), My Kaftan (UAE) and Hama Yassen (Jordan). Coinciding with International Women’s Day, March 8, day two of Dubai Modest Fashion Week kicked off with a talk focusing upon that very special occasion. Guest speakers Samah Safi, Muna Al Harbi, Yasmine Youssari, Leyla Fathallah discussed the power of women in our communities and the importance of supporting one another. First show of the day highlighted the work of Mayada Apparel (Canada), Victoria Design (Estonia), Johar (Jordan/UAE), Devi Janeeta (Indonesia), S by Samar (UAE) and e-commerce platform Modest Catwalk, representing #Markamarie, Aya Hammoud, Dilbar, Zahra, Lyaman Hajiyeva and Ranazone, followed by an in-depth discussion “Introducing Azerbaijan Modest Fashion” by speakers Dilyara Sadrieva and Farida Afandiyeva. And as the sun set on DMFW day two, guests lined the catwalk to see Sempre (Turkey), #Markamarie x Naj tags (Indonesia & Lebanon/UAE), JG Couture (UAE), Mariyan Suleymanova (Russia), Ouafae Taame (USA) and Blue Chocolate Presents Dulce by Safiya (UAE), before heading into the last Talkshow of the day. Focusing on “Unique Jobs in Fashion”, speakers Asma Lootah, Sara Jamshidi, Sahar Foad and Omayma Kouas discussed the diversity of specific talents required by the fashion industry, hosted by Aristochick. A bright and brilliant final show featuring Kazeca Studio (Australia), JD by Jaida Darguti (Turkey), Lina Sukijo (Indonesia) and The Hijab Lee (India) rounded up day two, closing with an exclusive show launching design house Boutallion (Netherlands). Showcasing 20 luxurious, artistic pieces inspired by gardens and florals, and attended by dozens of VIPSs and royal guests, the final catwalk show of the event was a dazzling end to a dynamic and diverse exhibition of global modest fashion flair. With a closing speech by Modest Fashion Weeks co-founders Ozlem Sahin and Franka Soeria thanking all participants, partners and visitors of the show, their message focused on supporting businesses in the industry, the importance of diversity and inclusivity and helping people network so everyone can benefit from this very special global event. With Saturday March 9 dedicated to industry talks and workshops, networking events and an opportunity to shop the collections of designs seen on the catwalk over the weekend, DMFW 2019’s final day celebrated a new diversity in fashion, and the burgeoning business prospects the modest fashion industry offers to the talent-rich region of the Middle East. Next Story : Pomsies launch six new Fabulous Friends!